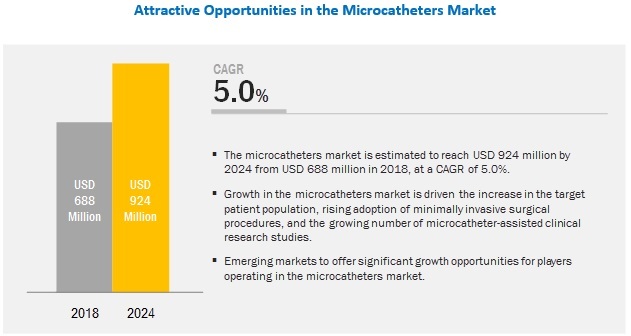 [150 Pages Report] The global microcatheters market is projected to reach USD 924 Million by 2024 from USD 688 Million in 2018, at a CAGR of 5.0% from 2018 to 2024. The growth of this market is primarily driven by majorly driven by the growth in the target patient population (suffering from cardiovascular diseases, neurovascular disorders, and cancer), rising adoption of minimally invasive surgical procedures, and the increasing number of microcatheter-assisted clinical research studies. Based on cancer type, the microcatheters market is segmented into liver cancer, kidney cancer, lung cancer, bone cancer, and other cancers (includes pediatric cancer, prostate cancer, and breast cancer). The liver cancer segment accounted for the largest share in of the microcatheters market in 2018. The large share of this segment is attributed to factors such as rising cases of liver cancer across the globe and growing initiatives/research activities for developing advanced liver cancer therapies using microcatheters. Based on end users, the microcatheters market is segmented into hospitals, surgical centers, & specialty clinics; and ambulatory care centers. In 2018, the hospitals, surgical centers, & specialty clinics segment accounted for the largest market share majorly due to the growing number of hospitals and specialty clinics in emerging countries; increasing prevalence of target diseases; and large number of surgical and diagnostic procedures performed across these facilities. North America is expected to account for largest share in the global microcatheters market in 2018. However, APAC is expected to grow at the highest CAGR during the forecast period. Emerging economies in the region such as India, China, and South Korea along with developed markets such as Japan and Australia are offering high-growth opportunities for market players in the field of microcatheters. This can be attributed to factors such as presence of a large patient pool, increasing prevalence & incidence of target diseases, growing healthcare infrastructure in Asian countries, and favorable government initiatives. The major players operating in the microcatheters market include Boston Scientific Corporation (US), Medtronic Plc (Ireland), Terumo Corporation (Japan), ASAHI INTECC CO., LTD. (Japan), MERIT MEDICAL SYSTEMS, INC. (US), Teleflex Incorporated (US), Johnson and Johnson (US), Stryker Corporation (US), Cook Group Incorporated (US), Cardinal Health, Inc. (US), Becton, Dickinson and Company (US), B. Braun Melsungen AG (Germany), AngioDynamics, Inc. (US), Penumbra (US), and BTG PLC (UK), among others. An analysis of the market developments between 2015 and 2019 revealed that several growth strategies such as product launches and enhancements, partnerships, collaborations, and strategic acquisitions were adopted by market players to strengthen their product portfolios and maintain a competitive position in the microcatheters market. Among these business strategies, acquisitions were the most widely adopted growth strategies by market players. Medtronic Plc (Ireland) is one of the leading player in the microcatheters market. The company has a strong product portfolio for microcatheters and to strengthen its current position in the microcatheters market, Medtronic is focusing on inorganic business growth strategies such as acquisitions and expansions. In line with this strategy, Medtronic acquired Covidien at a value of USD 42.9 billion in 2015 to strengthen its interventional product portfolio. The company is also expanding its R&D capabilities to aid product development and commercialization across major and emerging markets. Medtronic has been investing significantly in strengthening its localized product development capabilities, particularly in emerging markets. It recently established R&D centers in Brazil and South Korea, enhancing its research capabilities and presence in the Asian & Latin American markets respectively. What are the growth opportunities related to the adoption of microcatheters across major regions in the future? Emerging countries have immense opportunities for the growth and adoption of microcatheters procedures. Will this scenario continue in the next five years? What are the major application areas of microcatheters? What are the potential applications offering growth to microcatheter manufacturers? The study involved four major activities to estimate the current size of the microcatheters market. Exhaustive secondary research was done to collect information on the market and its different subsegments. The next step was to validate these findings, assumptions, and sizing with industry experts across the value chain through primary research. Both top-down and bottom-up approaches were employed to estimate the complete market size. Thereafter, market breakdown and data triangulation procedures were used to estimate the size of the segments and subsegments. Extensive primary research was conducted after acquiring knowledge about the microcatheters market scenario through secondary research. A significant number of primary interviews were conducted from both the demand (healthcare providers, research institutes, physicians, and healthcare professionals) and supply sides (developers, manufacturers, and distributors of microcatheters products). The primaries interviewed for this study include experts from the microcatheters and minimally invasive devices industry (such as CEOs, VPs, directors, sales heads, and marketing managers of tier 1, 2, and 3 companies engaged in offering microcatheters across the globe) and administrators & purchase managers of hospitals, interventional cardiologist, neurologist, ambulatory care centers, and healthcare service providers. 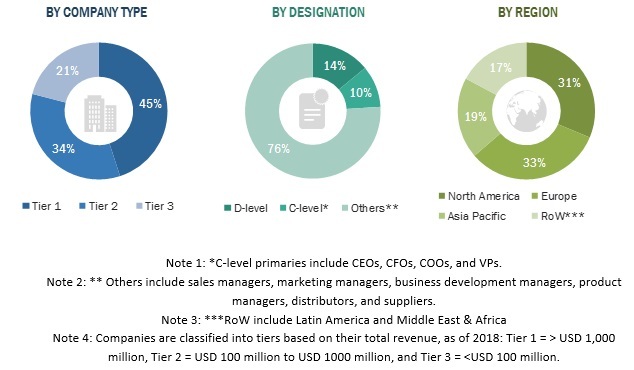 After arriving at the overall market size of the microcatheters industry from the market estimation approach explained above, the global market was split into several segments and sub-segments. To complete the overall market engineering process and to arrive at the exact market value data, data triangulation and market breakdown methodology methods were employed, wherever applicable. The data was triangulated by studying various factors and trends from both the demand and supply side analysis. To define, describe, and forecast the global microcatheters market on the basis of product type, product design, application, and end user, and region. To provide detailed information regarding major factors influencing the growth of the market (such as drivers, restraints, opportunities, and industry-specific challenges). To forecast the revenue of the market segments with respect to five main regions, namely, North America (US and Canada), Europe (Germany, France, the UK, and the Rest of Europe), Asia Pacific (China, Japan, India, and the Rest of Asia Pacific), Latin America, and the Middle East and Africa (MEA). To track and analyze competitive developments such as new product launches; agreements, partnerships, and joint ventures; mergers & acquisitions; business expansions and research & development activities in the microcatheters market. North America (US & Canada), Europe (Germany, France, UK, and RoE), APAC (Japan, China, India, and RoAPAC), and LATAM and MEA. This research report categorizes the microcatheters market based on Product type, Product design, Application, End User, and Region.